Have you ever done MRI? If yes, you probably remember, it is not the most pleasant experience. MRI is claustrophobic, loud, and takes a long time. The main reason for these problems — high magnetic fields. Would it be cool to avoid them? Why can’t we simply do MRI without magnetic fields? To understand why high magnetic fields are needed to obtain magnetic resonance images, we need to understand the principles of signal detection and the concept of polarization. Some atomic nuclei possess a property called spin and, therefore, produce magnetic fields. These nuclei can simply be visualized as tiny magnets (magnetic dipoles) swirling in space as their hosts — molecules — move, rotate or vibrate depending on the physical state of the chemical system they comprise (solid, liquid or gas). The level to which spins are polarized in the picture above is extremely exaggerated. In reality, even in the very high magnetic fields of modern magnetic resonance spectrometers and imaging scanners (thousands of times higher than the Earth’s magnetic field), nuclear spin polarization is only a fraction of percent. Complete (100%) polarization is also possible. However, instead of placing spins in high fields, it is practically more feasible to use a different approach. Physicists and chemists came up with several creative techniques to create extremely high polarization or hyperpolarization. Techniques based on chemical reactions (such as parahydrogen-induced polarization) are my favorite ones since they don’t require magnetic fields at all (in reality, polarization in such techniques can still be magnetic-field-dependent but the requirements are very modest). Now about detection. Nuclear magnetism can be detected in several ways. 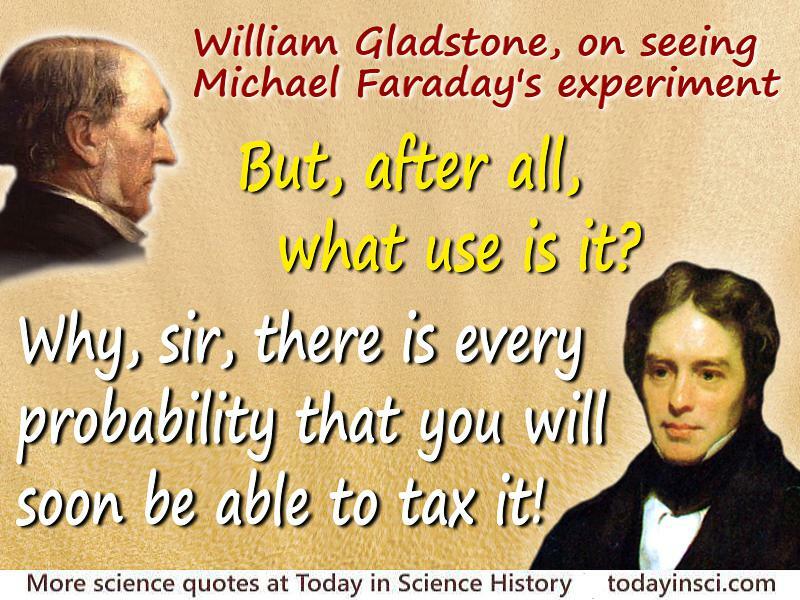 I will talk about two ways and both of them are named after a brilliant physicist Michael Faraday. Collective nuclear spin magnetization (M) is rotating about the magnetic field (B0). When a pre-polarized (or, simply speaking, pre-magnetized) sample is placed in such a field, M starts oscillating and its z-component generates an oscillating voltage across the coil’s terminals according to the Faraday’s law. 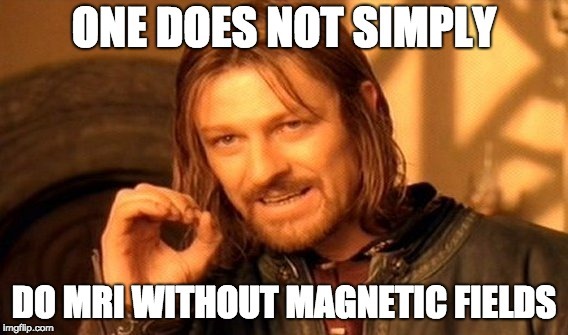 The problem is that it is really hard to construct magnets that produce high magnetic fields. Moreover, these fields need to be very uniform to be suitable for magnetic resonance purposes. This is why bores of MRI scanners are usually small – this way engineers achieve higher magnetic field homogeneity over the active volume. The conventional logic of MRI engineers is straightforward: by using higher magnetic fields (1) we achieve higher nuclear spin polarization (indeed, polarization scales linearly with the applied field B0) and (2) we increase sensitivity of the detection (the voltage generated in the coil by Faraday’s law is linearly proportional to the oscillation frequency which, in turn, proportional to B0). Therefore, conventional MRI signal scales as a square of the magnetic field. Higher the field is — bigger the magnet should be, and we already reached the limits of our engineering capabilities to make the highest magnetic fields that are stable and uniform. Now imagine that we already have high polarization produced without magnetic fields, for example, via chemical reactions mentioned above. Therefore, the signal is only linearly proportional to the magnetic field strength and even low magnetic fields can be used to produce high-quality images. Bubbling para-H2 gas through a solution containing a “polarizable” substrate and a SABRE catalyst. The gas that we used is parahydrogen (para-H2) and the enhanced nuclear polarization in solution is the result of Signal Amplification By Reversible Exchange (SABRE) effect. This effect is a remarkable consequence of the interplay between chemical kinetics and nuclear spin dynamics. Unfortunately, explaining it here, in this post, would require many more words and even some math 🙂 But the main point is simple: bubbling the gas through the solution results in high nuclear polarization and, therefore, high MRI contrast. Without bubbling the gas, magnetic nuclei are oriented randomly and the signal is too low to be detected. MRI of a SABRE solution at the Earth’s magnetic field (left) when para-H2 gas is bubbled and (middle) when the gas supply is ceased. (Right) Proton Nuclear Magnetic Resonance (NMR) spectrum of the solution at the Earth’s magnetic field. This idea of avoiding magnetic fields can be extended even further. Indeed, if we don’t need a magnetic field to generate polarization, can we detect nuclear spin signals completely without magnets? This somewhat weird idea (magnetic resonance without magnets) is, in fact, one of the most outstanding achievements in magnetic resonance of the last decade. It was pioneered by chemists and physicists from UC Berkeley (laboratories of Alex Pines and Dmitry Budker). Magnetization (M) generated in a sample can be detected by atomic magnetometers. The most sensitive magnetometers operate at a near-zero magnetic field. Signal can be detected by lasers due to the Faraday effect using a variety of polarimetry schemes. The end result of this signal detection scheme is the same as before – the voltage is generated and picked up, this time by a photodetector. If magnetic fields coming from the sample are time-dependent, the voltage is time-dependent as well and it can be converted into a spectrum containing useful chemical information about the sample. I have recently read this article and it was well discussed how scientists keep discovering new interesting and important facts about our gastrointestinal tract and its effect on our wellbeing (including decision making and brain function). For example, it has been shown that if people eat more galactooligosaccharide, the fraction of bacteria Lactobacillus and Bifidobacteria in the gut increases among all other strains (because metabolism of these bacteria takes advantage of the excess of this chemical, a known prebiotic). At the same time, these particular strains of bacteria have been shown to produce certain neurotransmitters — chemicals that participate in our brain functioning (because neurotransmitters are responsible for the transmission of electrical signals between neurons). It is indeed possible that by eating certain types of food you can overproduce certain neurotransmitters and, therefore, influence your brain functioning — through bacteria in the gut (Figure 1). Figure 1. Feeding healthy volunteers with galactooligosaccharide resulted in the increased population of Lactobacillus and Bifidobacteria in the gut which, in turn, resulted in overproduction of neurotransmitters that affect anxiety, including one called brain-derived neurotrophic factor . What is even cooler, some bacteria have shown to affect people’s mood (possibly, by increasing production of “happiness hormones”, in other words, chemicals responsible for our social behavior). This is reasonable because happy people are more social which leads to a big evolutionary advance for these bacteria: they would obviously tend to spread better between social humans than between loners. Interesting, isn’t it? Let’s now think about it in an evolutionary context. Do bacteria in the gut understand that they change the social behavior of their hosts? The answer is – NO. They not only don’t know anything about social behavior, but they also don’t know that they have a host and even that they exist! Bacteria are simply self-sustaining chemical reactions capable of changing (mutating) their chemical dynamics. It is not that bacteria have goals to survive, they simply occur. One random mutation in their genome led to the overexpression of a random chemical which, by a myriad of other complicated chemical transformations led to the increase of a random neurotransmitter which, by accident, tended to affect social behavior of their hosts. Now, the bacteria have started to spread faster and still spread “happily” because these chemical dynamics help them to exist or, simply, to occur. We, humans, are chemical reactions too. All hopes and dreams in our brains are interactions between atoms, molecules and their collections. We just tend to occur because it is evolutionary logical. Our mood is chemistry too: serotonin is happiness, dopamine is pleasure, noradrenaline is concentration (Figure 2). Figure 2. The structures of neurotransmitters and their common effects on the mood, concentration, and learning. So, if all of this is chemistry, then how to study this? Are there techniques that would allow us to investigate gut microbiome and its effect on the brain non-invasively and in real time? “When Gut Bacteria Change Brain Function” by David Kohn. In this post, I would like to share some thoughts and realizations I learned from working with undergrads. While reading, try to focus on what could be learned from my experience and not on my particular situation. Most likely, a lot of the things I describe cannot be applied to every postdoc or graduate student. However, I believe that experience I have obtained can be extremely valuable for other Jedi masters looking to mentor their padawans! In October 2016, I was invited to work at the Pines Lab. It is hard to explain how excited I was! When I learned that I had the privilege of working under Alex Pines – an absolute legend, mentor, and leader in the field of magnetic resonance – I was over the moon. I was also thrilled by the atmosphere of UC Berkeley, where the concentration of IQ per square meter is mind-blowing. Although there were a lot of advantages related to my new position, I was also faced with some challenges in the new lab. One of which was the different dynamics amongst my lab associates. In previous labs, the associates consisted primarily of graduate students and postdocs. However, in Pines Lab, we have a different approach. As a well-accomplished scientist, Alex now believes that funding is best spent on postdocs and therefore, only a few of us are now working in the lab. However, we can’t accomplish everything alone and needed to reach out to others for help. Thankfully, UC Berkeley provides a win-win solution for this challenge: postdocs are open to mentoring students and the campus is full of bright and motivated undergrads eager to do research! I started a quest for my Jedi padawans by sending an E-mail to the chemical engineering undergraduate academic advisor requesting to advertise “the opening” for summer positions in the Pines Lab. Maybe my ad was just too good to refuse, or the UC Berkley students were absolutely eager for work, but in only two days I received more than thirty (thirty!) E-mails from students who were willing to work in the Lab! The hardest part was choosing only a small fraction of them. Long story short, this is how I ended up having 10 students… Yes, believe me, I could not take any less as they were all extremely motivated, knowledgeable, and willing to learn more at the same time! This being said, be sure that you take the right amount of students required for the project that you have in mind. Today, after more than a year of working with my students, teaching and mentoring them, finishing papers together and working on new ones, I feel happy and satisfied with my selection and decisions. My experience allowed me not only to learn a lot about how undergraduate students think and about what motivates them and what can boost their productivity, but it also allowed me to find the mentoring/teaching style that I feel most comfortable with. I found that, surprisingly, resumes of undergrads do not always correlate directly with their performance in the lab. However, it does not mean that you should completely disregard their scholarly performance when you are looking for them. The successful student should (1) have enough knowledge to be able to quickly grasp the ideas and concepts you work with but at the same time (2) have enough curiosity to learn more about things they don’t know about. Unfortunately, NMR as a research topic requires at least a basic understanding of quantum mechanics, therefore making it an overall challenging subject for freshmen and sophomore students (however, there could be exceptions!). Therefore, in my opinion, the best way to find a prospective student is to talk to them in person, ask about their interests/hobbies, what type of work they like and what they don’t like. From my conversations with potential undergrads, I realized that those who like a more structured way of working and need a lot of supervising would not be the best match for me. The last point, personality matching, is the main lesson I gained from my experience. Personality matters much more than anything else in research with undergrads, and I feel that this can be even truer for higher levels of graduate school in which professor-student interactions play a crucial role in a lab’s success! Have you ever heard about the Myers-Briggs 16 personality types? If not, you should learn about it as soon as possible. Basically, this “theory” allows you to rationalize your own behavior and better understand the motivations of different types of people. It also explains why some individuals are naturally stronger in certain tasks and others are better at different ones. Therefore, when managing undergraduate research, you can always find a fulfilling and interesting problem for a student if you identify his/her personality type and look at things creatively. Find the right problem for the right people. If you think the people are not right for the problems you post, chances are, it is not the right problem for the people you have. For example, I suggested two of my students work on the project of using Earth-field MRI combined with SABRE hyperpolarization. It soon became very clear to me that one of the students was more interested in studying the basics of MRI and the way the Earth-field imaging instrument works than the other. At one point I caught myself thinking that the second student was just lazier than the first one and much less motivated about going to the lab in general… However, purely by accident, I learned that the second student was interested in 3D modeling. We had another project in the lab that required machining a chemical reactor. Therefore, I asked him to make a 3D modeling of the reactor and found that he loved it. Ever since then, he was an absolutely different person – working hard and passionately while finishing the task much earlier than I expected. It was not the laziness of the student but rather my misunderstanding of his interests that did not allow him to be as motivated as he can be at the beginning of our work. Take-home message – find the right problem for the right people. If you think the people are not right for the problems you post, chances are, it is not the right problem for the people you have. This is especially true for doing research with undergrads: they are volunteering their time to help you and it is your fault if are not motivated! I found that it is very important for students to work on problems that have clearly posted goals. For example, when choosing between two projects, one of which is very cool but relatively abstract and the second one which is less intellectually complicated but more practical, students often choose the second one. They want to see the immediate outcome of their research even though it is sometimes hard to get enough results given the limits of their residence in the lab. The most compelling project for undergrads is one that to them, makes an observable difference in the world! The most compelling project for undergrads is one that to them, makes an observable difference in the world! One of these application-oriented projects was the building of the para-H2-based polarizer. I explained to my students that I want to make a device that can automatically produce boluses of hyperpolarized liquids (for example, aqueous solutions of 13C-hyperpolarized metabolites such as pyruvate or lactate). Once produced, these boluses can be injected into animals and their metabolism can be monitored in vivo using NMR/MRI. Nick and Lucia conducting SABRE experiments. This idea is not new and many researchers work on different aspects of this problem. However, one of the biggest issues preventing the widespread applicability of para-H2-based techniques is the presence of platinum-group metals in solutions with hyperpolarized molecules. Obviously, injecting even trace quantities of the metals in vivo should be avoided. Therefore, we decided to focus on this part of the problem and at the same time started building para-H2-based polarizer. Two of my students were working on the testing of different scavengers’ performance by means of inductively coupled plasma atomic emission spectroscopy (ICP-AES) and three of the students were helping to build a so-called “hyper-cart”, a transportable cart containing all of the components necessary for producing hyperpolarized compounds. Elizabeth, Lucia, and Nevin are working on building the parahydrogen “hyper-cart”. After performing a lot of tests, we were able to identify the nature of two commercially available metal scavengers that can efficiently and very quickly clear the hyperpolarized solutions from the trace metal quantities. Since the result was important, we decided to submit a paper describing the metal scavenging process to the Journal of Physical Chemistry Letters and it was successfully published there. It was a pleasure to see the students’ motivation when, even during their midterm exams, they were still able to find time to stay at work late to finish the figures and tables for the paper! Overall, despite challenges, this was a good research project for undergrads: a simple and clear idea resulting in a measurable advancement to the field. One of the biggest realizations that occurred to me while working with my students was understanding of the difference between managing and mentoring. Managing is about organizing, making plans, setting up goals, splitting them into micro-goals, setting up the deadlines and so on. In other words, all the stuff that I hate… Mentoring, on the other hand, is giving padawans the opportunity to learn by doing their own work, providing resources and support, discussing the best ways to achieve the goals (as opposed to stating them), referring to the resources with useful information and troubleshooting when things don’t work. Through my experience, I found that mentoring is something I truly enjoy. You can clearly see the growth of students who are willing to learn! This is why personality matching is important. Some students would require more of a managing advisor while my approach leaned towards mentoring and allowing the student to figure out the details by himself. Not everyone would be able to do what Vincent has done, but his desire to learn, coupled with his desire to make a significant contribution to the project led to a successful outcome. I also found another valuable tool for mentoring students – Journal Clubs. I first learned about this type of meetings looking at Mark Does’ lab at the Vanderbilt Institute of Imaging Science. In Mark’s lab, students and postdocs meet once a week (in addition to weekly group meetings) and discuss a paper they want to learn more about. Mark does not even show up there – it is the students’ task to meet and study together. My journal clubs were slightly different than the ones at Vanderbilt. Since my students are only undergrads, letting them learn completely by themselves would not be the most productive option. Therefore, a schedule of students was created before each semester. For each journal club, one of the students had to choose a paper of interest. Ideally, it should be a paper related to our research but this was not necessary. After choosing a topic of interest, a student would send his paper for the rest of the group in advance to read it and prepare for the discussion. When arriving at the journal club, the student would first make a short presentation about the paper and then discuss it with the rest of the group. I would then show up after 30-40 mins and work together to answer any questions the students had. We also discussed NMR-related and general scientific questions after I arrived. Joseph is explaining approaches to study chemical kinetics by NMR. Based on the students’ reviews, they liked the journal clubs a lot. It helps them understand the research process and how to work with each other without a lot of guidance. I originally realized that students were not as eager to ask each other questions while I was in the room. This is why I decided to let them have 30-40 minutes on their own: this way I always entered a room full of discussion and exploration. They didn’t need my micro-management and ultimately worked together to facilitate ideas and find the answers to unknown questions. Here is the biggest realization. Undergraduate students are not small graduate students. While graduate students have the time and ability to focus on projects, undergraduates have other responsibilities to classes, college activities, and simply navigating their busy university life. Therefore, they need to be treated differently than graduate students. Although optimism is great, do not be discouraged if you undergraduate students have other time commitments and responsibilities that interfere with their projects. They are not smaller, younger graduate students but rather have unique requirements and standards of learning all of their own. Hyun, Nick, James, Lucia, Nevin, and Dario making a birthday gift for me. I want to express gratitude and say thanks to all undergraduate students I had a pleasure to mentor: Patricia Buenbrazo, Nevin Widarman, Hubert Situ, James (Xingyang) Li, Dario Gelevski, Vincent Stevenson, Lucia Ke, Elizabeth Chyn, Nick (Hao) Zhang, Hyun Park, Sean Littleton. Some of them have already graduated, some of them are still working on exciting projects and I hope to have a chance to mentor many more! 🙂 I also want to say a lot of thanks to Jessica Andrews who helped me to write this post and suggested the Master Yoda quotes idea. Check out her website: she writes about TV and movies and she is very passionate about it! And of course, let the force be with you. Interactions between spins are fundamental for understanding magnetic resonance. One of the most important ones is the magnetic dipole-dipole interaction. Spins act as tiny magnets, thus, they can interact with each other directly through space, pretty much the same way as classical magnetic dipoles (Figure 1). In NMR, dipole-dipole interactions very often determine lineshapes of solid-state samples and relaxation rates of nuclei in the liquid state. Figure 1. Nuclear spin 1 produces the magnetic field that is sensed by a spin 2. Similarly, nuclear spin 2 produces the magnetic field that is sensed by a spin 1.
where , and are gyromagnetic ratios of the spins, is the distance between them. Meaning of the angle can be seen from the Figure 2. But how was this expression derived? Figure 2. Two nuclear spins, 1 and 2, are separated by the distance r. is defined as an angle between z-direction of the coordinate system and the vector connecting the two spins. If there is an external magnetic field B0, it is usually defined along the z-axis. where is a unit vector. It is easy to show that . To summarize, the Hamiltonian of two interacting spins is a matrix composed of 6 operators. Each of the letters of the dipolar alphabet corresponds to certain matrix elements in the final Hamiltonian (Figure 3). Figure 3. If written in Zeeman basis (αα, αβ, βα and ββ), dipole-dipole Hamiltonian can be split into the following 6 terms of the “Dipolar Alphabet”. Without an externally imposed direction in space (for example, in the case of two equivalent spins in zero magnetic field), all of the terms of the dipole-dipole Hamiltonian need to be used for calculating an NMR spectrum. This is because all orientations in space are equivalent. However, in the presence of the external high magnetic field, the Hamiltonian can be simplified via the use of so-called “secular approximation”. where is a “large” operator and is a “small” operator. In our case, can be an operator describing the interaction with the magnetic field (Zeeman Hamiltonian) and is DD Hamiltonian. Eigenstates of the Zeeman Hamiltonian are familiar αα, αβ, βα, ββ. Generally, does not commute with , therefore, if written in the eigenbasis of , it has finite elements everywhere. The secular approximation for means that we leave only the blocks that correspond to the eigenvalue structure of the operator (Figure 4) and disregard all other elements. Figure 4. Energy level structure of the Zeeman Hamiltonian: lowest energy level (E1) corresponds to the state αα, energy levels E2 and E3 correspond to the states αβ and βα. The highest energy level (E4) corresponds to the nuclear spin state ββ. The essence of secular approximation is to make the to-be-simplified Hamiltonian match the eigenvalue structure of the main Hamiltonian. One can see from Figure 3 that the first two terms of the DD Hamiltonian will match the structure of the Zeeman Hamiltonian. Overall, this is how you go from the classical description of the magnetic field of the dipole to the truncated form of the Hamiltonian in the high nagnetic field. In the next post I will show how this Hamiltonian leads to the characteristic lineshape of the NMR line for solids. Friday evening. While his friends had already met in the Pub on Shattuck Avenue to celebrate a happy hour, UC Berkeley’s Ph.D. student Henry Bryndza was still in the Lab. He wanted to finish preparation of his samples so that he could come over on Monday morning to focus on the NMR measurements, not worrying about sample preparations. In order to suppress chemical reactions which could have started in his samples over the weekend, Henry put them in the liquid nitrogen dewar (T=-196oC). Henry was working in the Laboratory of Robert Bergman, a renowned UC Berkeley professor who has made a significant contribution to the organic and metallorganic chemistry. Bergman and Bryndza were studying Fischer–Tropsch reactions using exemplary Cobalt and Iridium catalysts . When he came back on Monday, Henry started to observe very interesting phenomena. 1H NMR spectra of the samples he took in the morning showed very weird “negative” NMR peaks (Figure 1). Moreover, the intensity of these peaks decreased day after day during the week when Henry tried to repeat the experiments and completely disappeared by the end of the week . Henry was confused and decided to repeat his measurements. Surprisingly, this phenomenon was not observed every single time but was definitely the strongest on Mondays. Bergman and Bryndza decided to jestingly call this a “Monday phenomenon”; this was the beginning of what was known later as Parahydrogen-Induced Polarization (PHIP). Figure 1. “Pseudo-CIDNP” observed in 1H NMR spectra during hydrogenolysis reactions of Cobalt alkylidyne complexes. Adapted from . Bryndza and Bergman asked for help from many NMR specialists, including NMR expert Professor Alex Pines from UC Berkeley and Professor Joachim Bargon from the University of Bonn . The last one was known for the discovery of so-called chemically-induced dynamic nuclear polarization (CIDNP). The CIDNP effect is usually manifested as positive and negative NMR signals (very similar to those observed in Henry’s experiments) for the reactions taking place via radical intermediates. After contacting Bargon and other CIDNP specialists, weird results were interpreted as “pseudo-CIDNP” in hydrogenation reactions . However, it was clear that CIDNP-based explanation was at least not complete, first, because of the very unusual suggestion of radical pairs in the studied hydrogenation reactions and, second, because of the lack of convincing simulations supporting the observed phenomena. Moreover, it by no means explained why the effect was the strongest on Mondays and why it was only observed in the laboratory of Robert Bergman. This “Monday morning” puzzle remained unresolved until the International Society of Magnetic Resonance meeting in Rio de Janeiro in June 1986. There, during an evening session, Professor Daniel Weitekamp from Caltech presented his “thought experiment” of using parahydrogen (para-H2) as a source of enhancing NMR signals. The concept and the expected results were immediately published in Physical Review Letters . The experimental demonstration conducted by a Weitekamp’s Ph.D. student Russ Bowers followed in July, and brilliantly supported all theoretical predictions (Figure 2) . Figure 2. First experimental demonstration of a PASADENA experiment. The characteristic PHIP multiplets are seen on the right. Adapted from . Bowers and Weitekamp called their experiment PASADENA (Parahydrogen And Synthesis Allow Dramatically Enhanced Nuclear Alignment) to glorify the location of their institute (Caltech is located in Pasadena, CA). After their publication, it immediately became obvious that PASADENA is, in fact, a correct explanation of “Monday phenomenon” of Bryndza and Bergman. Indeed, the low-temperature storage of NMR tubes over the weekend partially converted normal hydrogen into para-H2. The conversion was not complete, but it was enough to observe antiphase lines in 1H NMR spectra (Figure 1). The PASADENA effect and discovered later effect ALTADENA (Adiabatic Longitudinal Transport After Dissociation Engenders Net Alignment) were collectively given the name PHIP (Parahydrogen-Induced Polarization) . Now let’s talk about physical principles of this effect. As we discussed before, due to the absence of a net nuclear magnetic moment, para-H2 itself does not produce an NMR signal. However, this single nuclear spin state implies that, in a sense, it is cold. Indeed, a comparable degree of spin ordering is obtainable at equilibrium only at temperatures of a few mK and magnetic fields of several Tesla . The brilliance of Wetekamp’s idea was to introduce magnetic inequivalence to release this potential signal by connecting the singlet to the triplet states. This would require chemistry, but simple bond cleavage would not suffice. A singlet state of two protons is a relationship of one spin relative to the other and this order would be dissipated if the pair were split and mixed with an ensemble of other such products. Rather, it is necessary that the pair have a special relationship even after being distinguished by magnetic inequivalence. This is called a “pairwise” hydrogen addition and can be realized in hydrogenation reactions in the presence of homogeneous catalysts. To see how it works, let’s take as an example the simplest situation and imagine that a chemical reaction leads to the association of para-H2 with a molecule not containing magnetic nuclei. Figure 3. Schematic diagram of the PASADENA experiment: parahydrogen (para-H2) reacts with an unsaturated molecule forming a reaction product where two nascent para-H2 atoms occupy chemically inequivalent positions. Energy level diagrams and corresponding 1H NMR spectra are shown in the bottom. Thick blue rectangles indicate overpopulated energy levels. The two-spin system of the hydrogen molecule gives rise to four nuclear spin energy levels. As we described before, three of these energy levels correspond to orthohydrogen, the state with total nuclear spin 1 (triplet state), whereas the remaining fourth energy level corresponds to parahydrogen (singlet state), the state with zero total nuclear spin (Figure 3). Transitions between singlet and triplet spin states are forbidden by symmetry and the spin 0 parahydrogen is NMR-silent. Now, the incorporation of para-H2 into an asymmetric molecule breaks the symmetry of the singlet spin state. For simplicity, I will consider only the PASADENA experiment, the case where hydrogenation reaction is performed at a high magnetic field (wherein the chemical shift difference between the two para-H2-nascent protons is much greater than the spin-spin coupling J between them). In this situation, the population of the singlet spin state αβ–βα (numerical factor is omitted) of para-H2 is immediately transferred to the population of spin states αβ and βα of the formed spin system. This can be understood as follows. Because of the chemical reaction, two H atoms from para-H2 suddenly end up in a different molecular environment. This leads to a collapse of the nuclear spin wavefunction αβ–βα into one of the two states, αβ or βα, each with 50% probability. Next, it is easy to deduce from the energy level diagram that the NMR spectrum of the produced in such a manner molecule will contain four peaks grouped in two antiphase multiplets (Figure 3), exactly what was observed in the experiments of Bryndza (Figure 1) and Bowers (Figure 2). The key requirement is that both hydrogen protons from the para-H2 molecule are added together without significant competition from exchange reactions. This is a property of many, but not all, hydrogenations. negative-positive multiplets for products formed when RhI(CO)(PMe3)2 reacts with para-H2 in the absence (a) and presence (b) of styrene . The assignment of the peaks to particular transitions depends on the sign of the J-coupling between the para-H2-nascent hydrogens. When J-coupling is positive, PASADENA multiplets are positive-negative; if J-coupling is negative, the spectral appearance is opposite. This feature is very useful for studying hydrogenation reaction intermediates. Normally, organic molecules possess positive J-couplings between protons; and J-couplings between them are negative in case of metal hydrides. Therefore, in a complex reaction involving many intermediates, it becomes possible to distinguish low-concentration hydrides (possessing negative-positive multiplets) from organic reaction products (Figure 4). It is also important to realize that PHIP can lead to 100% nuclear spin polarization of the reaction product. In the case of PASADENA experiment, 100% population of para-H2 is split into just two energy levels, making transitions from these levels enhanced by orders of magnitude compared to the thermal case. Theoretically, if all para-H2 molecules are transferred to products in a pairwise manner and relaxation loses are minimized, the reaction product can acquire 100% spin polarization. This would, of course, require an additional step to transfer spin order from αβ and βα into the state αα but this can be readily realized using a simple RF pulse sequence. It is important to emphasize that only the connection between nuclear spin and rotational degrees of freedom allows this unique situation to take place. Indeed, the fact that the nuclear spin state can be overpopulated simply by cooling is a remarkable quality inherent only to the small hydrogen molecule. Indeed, even though other molecules can have the similar connection between rotational and nuclear spin states (N2, F2 etc. ), larger moments of inertia will make overpopulating these states much more challenging task (because of the lower temperature requirements). Moreover, it is very challenging to keep these molecules in the gas state at low temperatures, and the simple rule of making a total wavefunction be a product of individual wavefunctions will no longer hold true. So, it is more likely that hydrogen molecule is the only example when the rules of spin statistics and Pauli’s principle can lead to the nuclear spin hyperpolarization. What excites me about this story is how a purely thought experiment, on the one hand, and a weird experimental phenomenon, on the other hand, emerged into a new discipline and a remarkable tool to study chemical reactions. Moreover, more exciting applications of the para-H2-based hyperpolarization techniques are expected to emerge in biomedicine. I really wish there were more Monday morning effects in science! Who knows but maybe someone today has come to a lab to look at a weird result which will form a new field of study tomorrow. J. Bargon. Chance Discoveries of Hyperpolarization Phenomena. eMagRes, 2007. Private conversations with Robert Bergman and Alex Pines. P. F. Seidler, H. E. Bryndza, J. E. Frommer, L. S. Stuhi, R. G. Bergman. Synthesis of Trinuclear Alkylidyne Complexes from Dinuclear Alkyne Complexes and Metal Hydrides. CIDNP Evidence for Vinyl Radical Intermediates In the Hydrogenolysis of These Clusters. Organometallics, 1983, 2 (11), 1701-1705. C. R. Bowers, D. P. Weitekamp. Transformation of Symmetrization Order to Nuclear-Spin Magnetization by Chemical Reaction and Nuclear Magnetic Resonance. Phys. Rev. Lett., 1986, 57 (21), 2645-2648. C. R. Bowers, D. P. Weitekamp. Parahydrogen and Synthesis Allow Dramatically Enhanced Nuclear Alignment. J. Am. Chem. Soc., 1987, 109 (18), 5541-5542. J. Natterer, J. Bargon. Parahydrogen-Induced Polarization. Prog. Nucl. Magn. Reson. Spect. 1997, 31, 293-315. D. Weitekamp. Sensitivity Enhancement Through Spin Statistics. Encyclopedia of Magnetic Resonance, 2007. S. Colebrooke, S. Duckett, J. Lohman, R. Eisenberg. Hydrogenation studies involving halobis(phosphine)-rhodium(I) dimers: Use of parahydrogen-induced polarisation to detect species present at low concentration. Chem. Eur. J., 2004, 10, 2459–2474. To begin my blog, let’s introduce parahydrogen. Lately, this little molecule has been attracting a lot of attention in the magnetic resonance community due to tremendous opportunities it brings for NMR/MRI signal enhancement. I will explain a bit later how this parahydrogen-based NMR signal enhancement works. But first, let’s talk about physical origins of parahydrogen! Parahydrogen (para-H2) is a nuclear spin isomer of a hydrogen molecule. Nuclear spin isomerism is a very special form of isomerism. Unlike “traditional” molecular isomers (molecules having the same atomic composition but different chemical structure) and isotopologues (isomers that differ only in their isotopic composition), nuclear spin isomers are chemically identical: they have exactly the same atomic (and even isotopic) structure. However, nuclear spin isomers differ in the nuclear spin state of their atoms. It turns out that this tiny change (energy difference associated with nuclear spin transitions is only ~0.1 J/mol) may lead to different thermodynamic and spectroscopic properties of molecules. So, how does this work? Unfortunately (or fortunately), we will have to use rules of quantum mechanics and some math. In quantum mechanics, in order to describe properties of quantum systems (atoms, molecules, etc. ), physicists use wavefunctions. By knowing a wavefunction one will be able to calculate probabilities to find a quantum system in different states (namely, a squared modulus of the wavefunction determines the probability to find a system in a given state). Let’s look how it works taking as an example hydrogen molecule. Hydrogen molecule consists of two hydrogen atoms (H) and is denoted as Н2. Each atom has a nucleus – a proton which is a spin-1/2 particle. Physicists say that hydrogen molecule has several degrees of freedom: translational, rotational, vibrational, etc., and these degrees of freedom can be considered independent. In other words, rotation of the hydrogen molecule does not depend on how and where the molecule is moving and how it is vibrating. Each degree of freedom has a wavefunction associated with it. I will use different colors to describe electron and nuclear wavefunctions. A position of the molecule in space, as well as its rotation and vibrations, are determined by the position and movements of nuclei, therefore, these degrees of freedom are described by translational (ψtr), rotational (ψrot), vibrational (ψvib), and nuclear spin (ψspin) wavefunctions. Atomic nuclei are surrounded by electrons which provides the bonding between the nuclei. The wavefunction describing movements of electrons is called orbital wavefunction ψorb, and state of the electron spins is described by the electron spin wavefunction ψspin. However, rules of quantum mechanics are trickier than they may sound. According to Pauli’s principle, the total wavefunction of the system of spins-1/2 particles has to be antisymmetric with respect to the exchange (also called permutation) of two identical particles. What does this mean? Let’s take for example ψspin. A system consisting of two spins-1/2 can be described as α1α2, β1β2 or combinations α1β2+β1α2, α1β2–β1α2. Here α and β denote the projection of nuclear spin angular momentum along the quantization axis (more on this stuff later, for now, one can imagine the state α as a magnetic moment – spin – pointing up along the external magnetic field and the state β as a magnetic moment pointing down, opposite to the field). Indexes 1 and 2 say to which nucleus the spin belongs. For example, the state α1α2 means that both nuclear spins point along the field while the state β1β2 means that both spins point opposite to the field. The combination states α1β2+β1α2 and α1β2–β1α2 are more interesting. Neither of spins points along or opposite to the field but if we take one spin and determine its orientation, the second spin will take the opposite orientation. We can see now that two spins are correlated: the state of the second spin depends on the state of the first one. Now let’s look what happens if we exchange (permute) particles. Mathematically, permutation simply means interchange of indexes (1→2, 2→1). One can see that upon permutation of indexes the first three states do not change: α2α1= α1α2, β2β1 = β1β2, (α2β1+β2α1) = (α1β2+β1α2), but the last state changes the sign: (α2β1–β2α1) = –(α1β2–β1α2). Therefore, the first three states are called symmetric wavefunctions and the last one – antisymmetric with respect to permutation of particles. So, our hydrogen molecule contains four spin-1/2 particles: two electrons and two nuclei). Permutation of electrons can only affect ψorb and ψspin. The first wave function, corresponding to the electronic ground state, is symmetric with respect to the electrons, the second, the electron spin wavefunction, is antisymmetric, and the rest are independent of the electrons’ variables and, thus, symmetric. Therefore, Pauli’s principle is fulfilled for electrons: the total wavefunction is antisymmetric with respect to permutation of electrons, thanks to antisymmetric ψspin. Permutation of nuclei can affect two wavefunctions: ψspin (as we just saw above) and ψrot. A mathematical expression for ψrot is rather complicated but it is not necessary to know its full form to understand the symmetry properties. Figure 1. Schematic energy diagram of rotational levels of the hydrogen molecule. where P12 represents the permutation operator that interchanges the nuclei’s positions (indexes). This means that the rotational wavefunction is symmetric for even rotational states (J = 0, 2, 4, …) and antisymmetric for odd rotational states (J = 1, 3, 5, …). Coming back to Pauli’s principle, permutation of nuclei should lead to the change of sign of the total wavefunction. Since only ψspin and ψrot can change sign upon such permutation, these two wavefunctions become connected: even (symmetric) rotational wavefunctions must be combined with the antisymmetric nuclear wavefunction (α1β2–β1α2), whereas each antisymmetric rotational wavefunction has to be associated with one of the three symmetric spin functions. All this is required to yield a total wavefunction being antisymmetric with respect to the exchange of the nuclei. This is where two hydrogen spin isomers come from. One is called parahydrogen (para-H2), having an antisymmetric nuclear spin wavefunction (α1β2–β1α2) and existing only in even rotational states, and the other called orthohydrogen (ortho-H2), having a symmetric nuclear spin wavefunction and existing only in the odd rotational states. It follows from the Pauli’s principle that nuclear spin state and rotational state of the hydrogen molecule are strictly correlated. This is remarkable, because the notion of independence (which allowed us to write a wavefunction as a product of individual wavefunctions) has led to complete dependence of these degrees of freedom from each other! Remarkably, parahydrogen and orthohydrogen can be seen as two individual gases because their thermodynamic properties (boiling point, heat capacity, etc.) are slightly different. This is not surprising taking into account the fact that molecules constituting these two gases are rotating differently! Importantly, conversion between the two states occurs extremely slowly because the transition between symmetric and antisymmetric nuclear spin states are forbidden by the selection rules of quantum mechanics. Therefore, after its production parahydrogen may be stored for long periods before use in a tank as an individual gas, as the relaxation rate of the parahydrogen back to room-temperature equilibrium can be on the order of months. However, the use of paramagnetic catalysts (i.e., activated charcoal, nickel, hydrated iron(III) oxide) promotes the establishment of Boltzmann thermodynamic equilibrium between ortho-H2/para-H2 states for a given temperature at greatly accelerated rates. This happens because paramagnetic materials can create a strong inhomogeneous magnetic field on the atomic scale. In such fields the two hydrogen atoms are no longer equivalent, thus, spin-flip transitions between ortho-H2 and para-H2 are no longer forbidden. In practice, normal hydrogen gas (i.e., equilibrium ratio of spin isomers at room temperature) consisting of 75% ortho– and 25% para-hydrogen is passed through a chamber filled with paramagnetic catalyst and maintained at cryogenic temperatures, where the equilibration to the isomer ratio governed by the Boltzmann distribution occurs. For example, a parahydrogen generator operating at 77 K (obtained conveniently by a liquid-N2 bath) yields a mixture with ~50% parahydrogen, whereas the designs based on cryo-chillers (e.g. T~20 K) yield >99% parahydrogen (Figure 2). I should note that the enrichment of hydrogen with para-isomer happens so easily only because of the big energy gap between rotational spin states. This, in turn, is due to the small mass of molecular hydrogen (in general, the energy difference between rotational spin states is inversely proportional to the moment of inertia of a rotating molecule). Figure 2. a) Equilibrium para-H2 fraction as a function of ortho-para conversion temperature. The plot shows that at temperatures near the boiling point (1), the equilibrium composition is almost pure parahydrogen, and at elevated temperatures, the composition asymptotically approaches a 3:1 ratio, (2) — liquid nitrogen temperature, (3) — room temperature. b) The population of rotational energy states (J = 1, 2, 3) of hydrogen as a function of temperature. The existence of nuclear spin isomers of molecular hydrogen (which was experimentally confirmed by the early 1930s) was one of the first triumphs of quantum mechanics. Indeed, the citation of the Nobel Prize awarded to Werner Heisenberg in 1932 stated that he had “created quantum mechanics, the application of which led to the discovery of the two allotropic forms of hydrogen”! Knowledge about ortho– to para-H2 conversion is important for the storage of liquid hydrogen (especially as a rocket fuel). The difference in energy associated with the different rotational levels means that energy is released when ortho-H2 converts to para-H2, and energy is absorbed in the reverse process. This phenomenon can be thought of as a latent heat of conversion. If one quickly liquefies normal hydrogen, it will still have 3:1 ortho:para composition which will eventually lead to the heat release. This can vaporize a significant portion of hydrogen and break the impermeability of the storage container. At the dawn of industrial liquid hydrogen production, this presented a major problem. Modern hydrogen liquefying processes now ensure that the liquid hydrogen has reached equilibrium concentration at 99.8% para-H2 before being transported and stored for use. One may ask how can para-H2 be important for NMR? Indeed, this spin isomer has a zero total nuclear spin and, thus, it does not possess 1H NMR spectrum. However, para-H2 is a pure quantum mechanical state and a highly organized spin order which is readily achievable simply by cooling. Pure state means that all para-H2 molecules are described by the same wavefunction – (α1β2–β1α2). For comparison, ortho-H2 is a mixture of three wavefunctions, α1α2, α1β2+β1α2 and β1β2 and, thus, it is not a pure state. It turns out that once you have a quantum mechanically pure state, you can manipulate it and transfer the spin order from one form to another. This is how parahydrogen-induced polarization (PHIP) and signal amplification by reversible exchange (SABRE) work: they transfer NMR-silent singlet spin order of para-H2 into observable nuclear magnetization. Hi all! I am very excited to launch my personal website/blog. I plan to use it as a platform to share educational content connected to my research interests and post my opinions/thoughts regarding important events (mainly focused on science). For more information about me visit About page. Ok, let’s hyperpolarize!